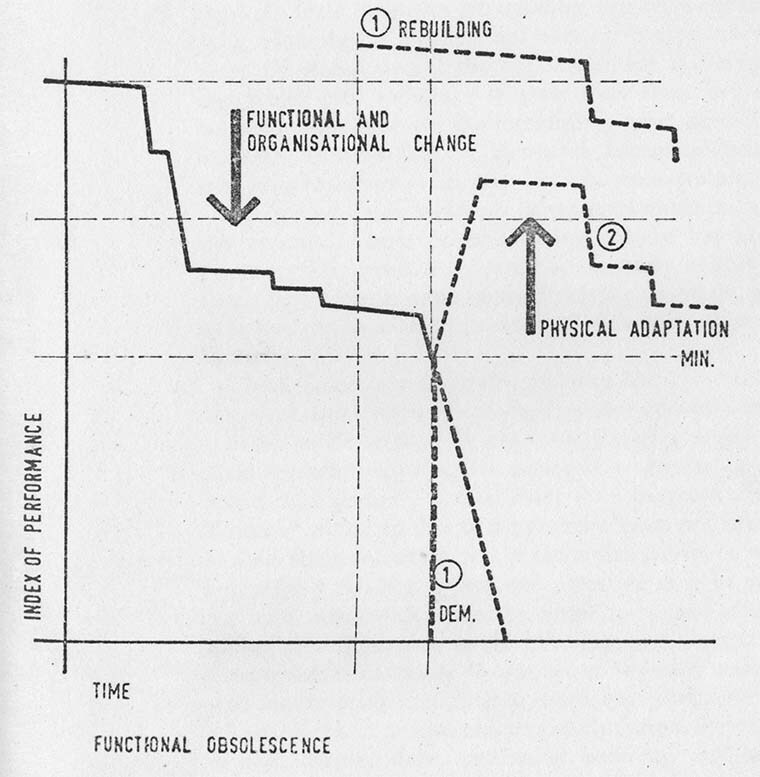 Peter Cowan, Functional Obsolescence from "Studies in Growth, Change, and Aging of Buildings," 1963, Transactions of the Bartlett Society 1 (1962–63). Obsolescence: An Architectural History is the first book to trace the idea of architectural obsolescence in twentieth-century architecture and urbanism: where the notion comes from that buildings and cities can suddenly lose their value and utility and so become expendable, and how architects and others responded to the perception that obsolescence characterized change in the modern built environment. Evolving out of early-twentieth-century US capitalist real estate development, the paradigm of obsolescence spread globally in the mid-century urban and social realms before impacting architecture directly. Some designers embraced obsolescence's liberating promise of expendability and short-life buildings. Others were horrified by its implications of ephemerality and waste, and sought to reverse obsolescence through tactics of preservationism, postmodernism, and ecologism. Obsolescence, thus understood, set the stage for its successor world-view of sustainability, today's dominant paradigm for comprehending and managing architectural change. Historicizing sustainability, the book glimpses critically at the present moment and beyond. Daniel M. Abramson is associate professor of art history and director of architectural studies at Tufts University. He holds master’s and doctoral degrees in art history from Harvard University. His research focuses upon questions of architecture, economy, and society from the eighteenth through twentieth centuries. He is the author of Building the Bank of England: Money, Architecture, Society, 1694–1942 (Yale University Press, 2005) and Skyscraper Rivals: The AIG Building and the Architecture of Wall Street (Princeton Architectural Press, 2001), as well as, with the Aggregate Architectural History Collaborative, coeditor of Governing By Design: Architecture, Economy, and Politics in the Twentieth Century (University of Pittsburgh Press, 2012). He has published articles and essays in the Journal of the Society of Architectural Historians, Architectural History, Critical Inquiry, Harvard Design Magazine, and Design and Culture. Research for his recent work on the architectural history of obsolescence has been supported by grants from the ACLS, the NEH, Harvard University, Wellesley College, and the Paul Mellon Centre (London).